A new museum that will house the largest collection of contemporary African art on the continent, will open in 2016 in the Victoria and Alfred Waterfront in Cape Town, it was announced last week. The institution will be known as the Zeitz Museum of Contemporary Art Africa, in honor of the German art collector Jochen Zeitz, who is providing the museum’s founding collection. It will be in the historic grain silo in the waterfront district, a prime residential and commercial area and tourist hub. The creation of the museum will be financed by the Victoria and Alfred Waterfront development project, which is contributing 500 million South African rand (about $50 million) to the transformation of the 187-foot tall grain silo, built in 1921. The architect will be announced in February. Mr. Zeitz, the former chairman of the sportswear company Puma, is considered a leading collector of contemporary African art. The new museum, which will include 102,000 square feet of exhibition and education spaces over nine floors, will house his extensive collection, which includes 85 works acquired at this year’s Venice Biennale — among them a series of photographs by Zanele Muholi of South Africa and sculptures by Michele Mathison of Zimbabwe. Mr. Zeitz has committed to underwriting the museum’s running costs and providing an acquisition budget, described as “substantial” in the press materials. The Mark Coetzee, a South African who is the curator of the Zeitz Collection, has been appointed the executive director and chief curator of the museum. The announcement came as a surprise to most of the South African art world, said Kim Stern, an art consultant and curator who divides her time between South Africa and New York. “I think they have been building this collection for a while with this in mind,” she said. “They are big purchasers, they buy the whole show.” Ms. Stern said the development was a positive one for Cape Town, and that the museum had the potential to become the most important collection of contemporary African art worldwide and an international tourist attraction. 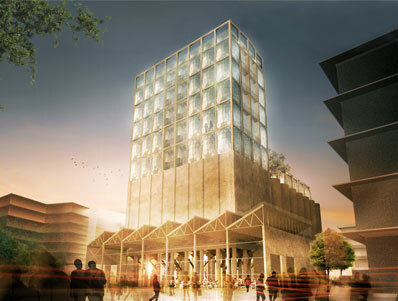 While the grain silo is being renovated, works from the Zeitz Collection will be on show in a temporary pavilion at the Victoria and Alfred Waterfront. The first exhibition, which opened on Saturday, features the work of the Swazi artist Nandipha Mntambo.